On the Paideia Blog thus far, we have generally focused on that which is beautiful. And strolling through the many rooms of the Palazza Nuovo at the Musei Capitolini, it is easy to see why: the surfeit of awe-inspiring classical sculptures here in Rome is overwhelming. Within just a few steps, you can admire the Dying Gaul, blush for the modest Venus Capitolina, and witness the very real intimacy between Amore e Psiche. Now, let us contemplate the ugly. The Sala dei filosofi, or Hall of the Philosophers, is situated just a few steps away from these marvels – but its aesthetic is decidedly more austere. From all angles of these two rooms, you are faced with rows of busts of famous Greek and Roman philosophers, politicians, and tragedians. The likenesses of the rhetorician Cicero, the mathematician Pythagoras, and the playwright Euripides surround you. All the great intellects of antiquity are represented. Many of the faces in the Sala are, unfortunately, not of great visual interest: some bear the historical figure’s signature features (Pythagoras’ cap, Homer’s scruffiness), while others would appear rather indistinct. Scanning around the room, however, two busts are surprisingly inelegant, even goofy. They are two mid-4th century B.C.E. representations of Socrates, the famed philosopher and, to some, Athens’ great public nuisance. Socrates’ exaggerated lips, markedly stubbed-nose, and bulging, wide-set eyes do not suggest a man of gravitas, especially in comparison with the other grand visages in the Sala dei filosofi. How can it be that Socrates, one of the founders of philosophy, has been excluded from the airbrushing artistic treatment that the other great minds generally received? Such representations were often meant to convey more than just realistic likeliness, but philosophical and political ideals. A beautiful outward appearance was often the symbol of inner virtue. How could Socrates’ wisdom possibly be conveyed through such an ugly appearance? Perhaps the artists could not escape the fact that Socrates, we are told, truly looked this comical. In Plato’s Symposium, Alcibiades provides a very vivid account of his mentor’s appearance. We learn also that Socrates has been rejecting the admiring affections of the legendarily handsome and courageous general Alcibiades. First, Alcibiades’ preface to his description of Socrates is the classic, “No offense, but…let me say something quite offensive.” Of course, Socrates is not one for false flattery – had Alcibiades said anything but the truth, Socrates would have set him straight. This also implies that Alcibiades’ description is no exaggeration. He compares Socrates to a statue of Silenus – an outwardly ugly figurine that, once broken open, revealed statues of the gods. It’s a simple allegory for uncovering a person’s inner beauty. The statues of the gods are representations of both wisdom and virtue, things that Socrates is believed to have in abundance. In fact, Socrates was often compared to Silenus, a mythological satyr and the wisest of Dionysius’ companions. 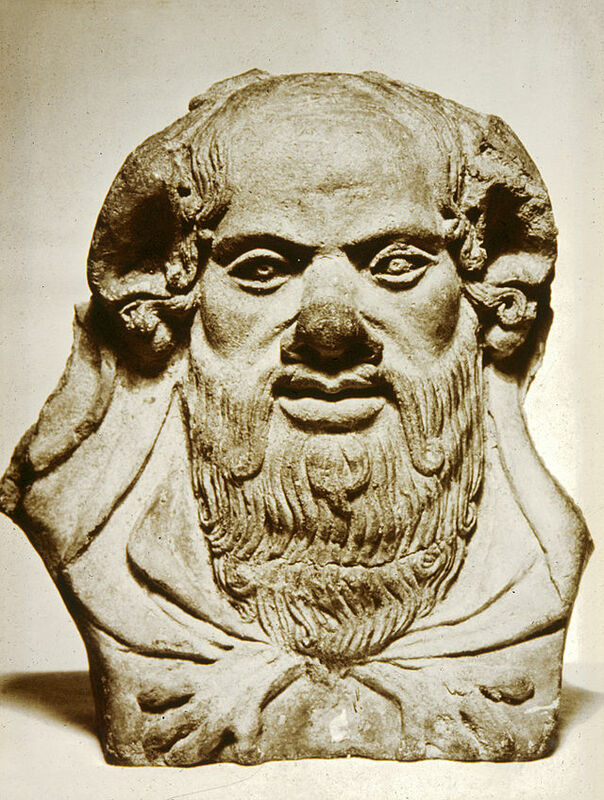 Below you can see an Etruscan terracotta depiction of Silenus, also made in the fourth-century B.C.E. The resemblance is uncanny. While Xenophon’s Socrates may not be absolutely serious about the force of this argument, these observations confront the audience’s perceptions about beauty and appearance. These passages serve to challenge our notions of beauty, just as Socrates served (according to him) the Athenians by challenging their notions of everything: virtue, the political craft, religion, even shoe-making. If the Socratic dialogues could confer any one piece of wisdom, it might be the importance of questioning appearances (of knowledge, of virtue, and certainly of beauty). In doing so, you may find yourself looking toward a higher sense of understanding about the world – that which lies beyond appearances. 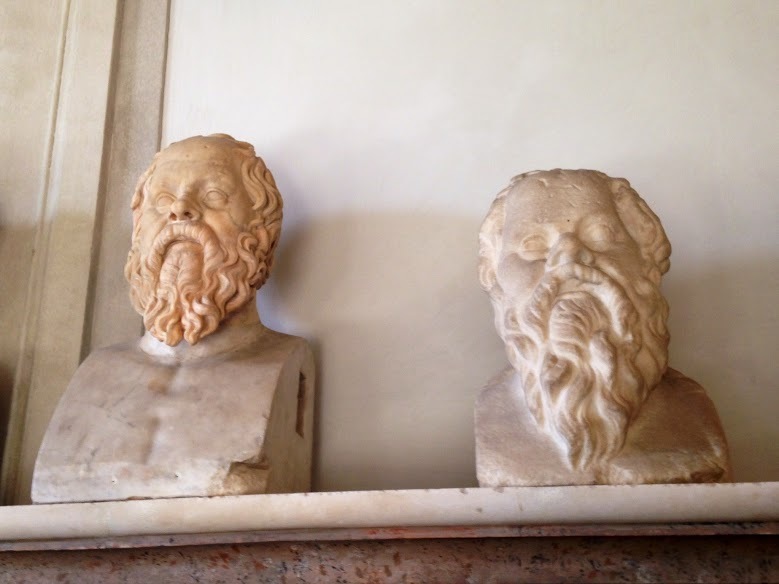 Returning to our busts, you may be struck by Socrates’ expression. With his up-turned nose, slightly opened lips, and raised eyebrows (you can even see the wrinkles in his forehead), Socrates’ expression appears to be, on the whole, up-lifted. He is looking beyond the trappings of the mortal world to a higher understanding of the universe. Both this up-liftedness and Socrates’ surprisingly unattractive appearance compel the viewer to do the same: look and see what lies beyond appearances. Plato, Syposium, 215a-b. You can read the translation here.